© Consider carefully where the bees will be eventually living before you get them. Once they are positioned, moving the hive full of bees can be a problem because of the bees homing instinct so plan ahead. "Bees will do anywhere" is an old beekeeping saying, in other words, the bees make the best of what they have but they do have some preferences. Hives don't take up much space and so they can fit just about anywhere, there is no need for a large garden. Most geographical areas provide more than enough forage for bees as they can work an area of 28 square miles surrounding the hive. Perfect sites can be few and far between but whilst they "will do anywhere", they will do much better in some places than others. Shelter from cold winds is possibly the most important consideration, bees do not like exposed locations - the ideal location would be sheltered on all sides but minimally try to avoid the east and north winds. Wind chill and wind speed will stop them from flying so position the hive in the lee of a hedge or windbreak if this is considered a problem. Willow, sunflowers or runner beans, for examples, can be grown to provide a windbreak and also forage for the bees. Placing the hive at the sheltered edge of a woodland is good but it should not be positioned under a tree canopy. Water dripping from the leaves means it "rains" a lot longer there preventing flying. In nature the bees would prefer their nest a few metres off the ground and if this is practical or appealing, why not? Hives on city rooftops are not uncommon. Horizontal Top Bar hives can be hung from trees and lowered for inspection. Obviously you do not need to have your hive in the air for the bees to prosper but they do not thrive if the hive is on the cold damp ground. Bricks, blocks or a Plastic Hive Stand must be used as a damp course either under the hive or the legs of a stand. This can also raise the hive to a height convenient for the beekeeper. The verticality of the comb is produced by the bees hanging like a plumb line so ensure the stand and hive are levelled in both directions - a saucer of water on the top of the hive makes a simple level. It makes little difference to the bees what way the entrance points as long as the hive is in a position to get the sun at least once a day, earlier better than later. If there is more than one hive in the apiary it is best to have the entrances of each hive pointing different directions. This reduces the possibility of bees accidentally returning to the wrong hive, known as "drifting". It has been shown that in a row of hives with their entrances all pointing the same way, one end hive will end up with a higher population than the rest due to drifting. This is not a good thing if you consider a queen coming back from a mating flight may enter the wrong hive. It can also quickly spread any disease throughout the apiary. There is no need for the hive to be outside at all as long as the bees can come and go. It is common in some countries to keep the hives in "bee sheds" or "bee houses", each colony having its own access to the outside. This is also the only way to prevent theft and vandalism. As long as the behaviour and needs of the bee are understood and met, the location and design of hives is only limited by practicality, imagination and ingenuity. 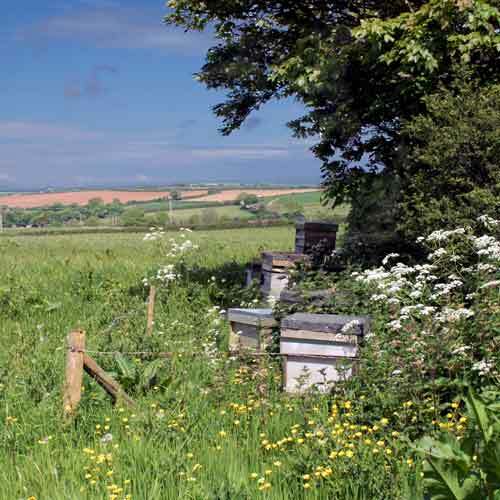 After the bees, the main consideration when deciding on a site is the preferences and needs of the people surrounding the hive. This is not only you but your family, neighbours and passers-by. People and bees normally only come into contact when their paths accidentally cross or when the hive has been opened or disturbed. For a risk assessment, hives should be placed so they are at least 10 meters away from the path of people. With bees flying at about 15 feet, accidental problems tend to arise when the bee is either just leaving or returning to the hive which brings them down to human level. Their flight paths to and from the entrance normally form quite a distinct funnel so this can be directed away from "people paths". Placing a hive near a high hedge or fence, for example, with its entrance pointing towards it will force the bees to fly up and over quickly reaching a safe altitude. This can also be achieved with artificial windbreaks if necessary. Sometimes the hive has to be disturbed such as during health checks and inspections for example. You must be aware that the bees will possibly blame anyone in the vicinity for the intrusion, including the neighbour sunbathing on the other side of the hedge. It must be said that in good conditions with considerate and gentle handling, most bees have little reaction at all. Problems can and will arise if the colony is disturbed out of season or when weather conditions are bad. Bees are also wild animals and cannot be predicted. The response of the general public to bees and bee hives also cannot be predicted. In our long experience, this can be just fear and loathing which can often be changed with a little education. Sadly the general public can also be responsible for vandalism and theft. Unless bee hives can only be seen by the benevolent then positioning hives out of sight is recommended wherever the apiary may be located.